Information sharing is one of the most vital aspects in the current technological era. There is a mushrooming of engineers within the country. This is where the story of Vivek Singh starts. He often calls himself as a simple guy with an Idea to skill maximum Students in India. 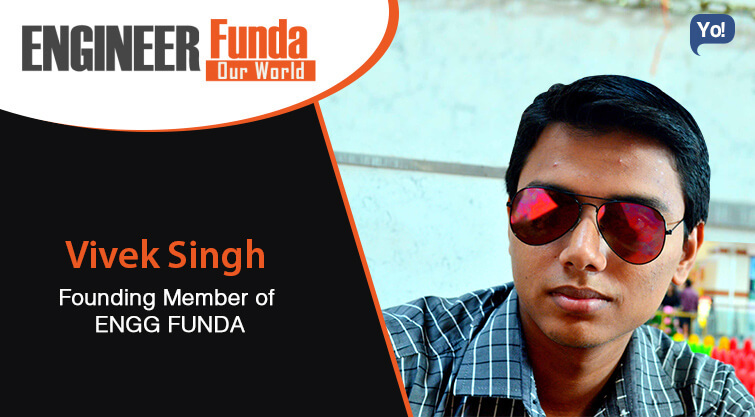 His answer to that problem is engineersfunda.com where budding engineers can come and find answers to their queries. He is an avid learner and often found surrounded by everything related to internet, technology and computing. After completing his under graduation, he faced many hardships trying to figure out a proper career path. This is where he conceptualized the idea to start a portal, where aspiring engineering students can all the answers related to their future career prospect, as well as education. He plans to make the website a one-stop hub of information for engineering students. Engineers Funda is all about Engineers Life. It is a One Stop Center for Every Engineering Student of any University. The Basic Motto of Engineers Funda is to make All University under One Roof. In Engineers Funda not only Jobs and Exams Update is there but also Some Recharge Tricks and Entertainment Videos. Well In 12th I usually searched for my future career, possible opportunity, best colleges and exams but hardly got any information about the required topic. Not only this I also consulted some pursuing engg. Student but they all said that their university is best. So I thought to make Engineers Funda which will not only be the center for engineering students but also for aspirants. I want All Universities to come under One Roof. Well the Most challenging part till now was in 2014 where I totally lost All My Domain Authority and also got penalized by Google Update because my authors article’s quality was not up to the mark. To overcome the Challenge I Learned about all the Updates Of Google and also Guided My Authors How to Write an Optimized Article and assist how to be more productive. There’s no habit which i would like to change but I’ll add One More Habit of Being a Good Leader. Overconfidence is the Only Mistake which I think any individual should avoid. Well I’ll Extend it to Offline Ground Also with Collaboration of Many Colleges So that I can Provide more services to students. This Time I would Like to Start a Website/Software/Apps Designing Firm In addition to that my firm will also provide Security to Online Org from Ha. “No One is There If You can’t Help Yourself”.